St Andrew’s church in the Shropshire village of Quatt stands on a small hill just outside the village. At first glance the church appears Georgian and much of the building dates from the 1760s but other features suggest a late Saxon origin. 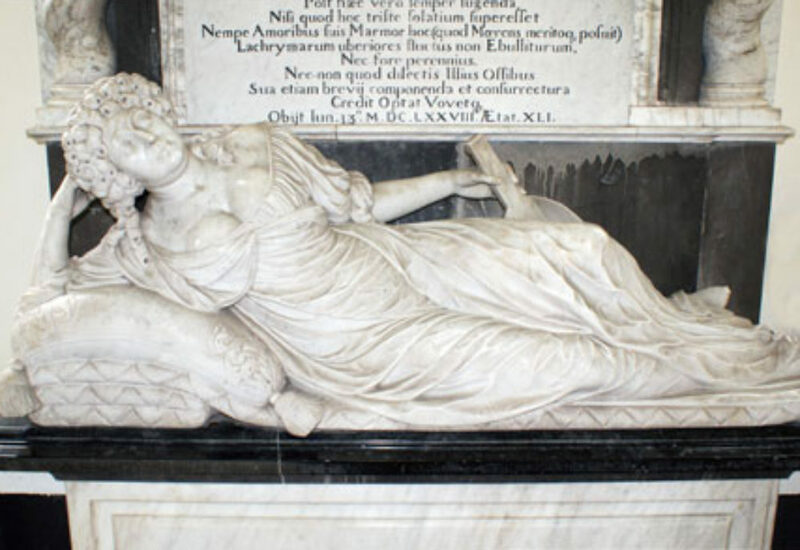 Entering via the porch at the west end, Lady Wolryche’s monument is positioned on the north wall to the left of two large table tombs commemorating Francis Wolryche (II) died 1689 and Sir Thomas Wolryche died 1668. Sir Thomas was knighted by Charles I in July 1641 and created first Baron Wolryche later that same year. During the civil war he raised troops for the Royalist cause and was later appointed governor of Bridgnorth Castle. Sir Thomas’ son, Sir Francis was declared insane and his fifth son, John, took over the estate and engaged Smith of Warwick as the architect to build the Dower House, a remarkable building, which occupies a site immediately opposite the church. This John (1637-85) was by profession a lawyer who was called to the Bar in 1661. He married Mary, daughter of Revd Dr Matthew Griffin, Chaplain to Charles I and Charles II and widow of George Elphick by whom she had one son, in about 1670. John died of smallpox in 1685. The main residence of the Wolryche family was Dudmaston Hall, in the possession of the family from 1403, and now in the care of the National Trust. The house contains a number of portraits of the family, including John Wolryche, but unfortunately not one of Mary. 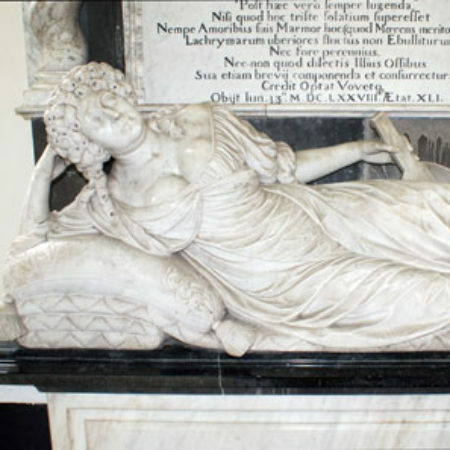 Lady Mary’s monument consists of a plain base with a moulded black marble top on which the effigy of Lady Mary reclines. Her upper body rests against a tassled cushion, her head supported by the right arm while her left hand holds a lute. She is dressed in a very revealing and low cut flowing gown while her hair falls in ringlets around her shoulders. Rising behind the effigy is a pair of candy-twist columns that support a plain entablature – with a winged cherub head in the centre – and an open segmental canopy complete with garlanded urn. At either end of the canopy is a Baroque cartouche of arms. A long Latin inscription details her life, family and death in childbirth at the age of 41. She was an accomplished singer and musician – hence the lute – and this is the only monument of the period to show a musical instrument. Clearly a high quality monument and sculpted by a master craftsman, the obvious question is, who made it? The pose of the figure, while not uncommon at this time, perhaps owes something to the innovations brought about by John Bushnell, but Lady Wolryche is clearly not Bushnell’s work. Lady Mary’s monument bears some similarity of execution to that of Thomas Vyner, erected 1673 originally at London, St Mary Woolnoth and now at Gauntby, Lincs. 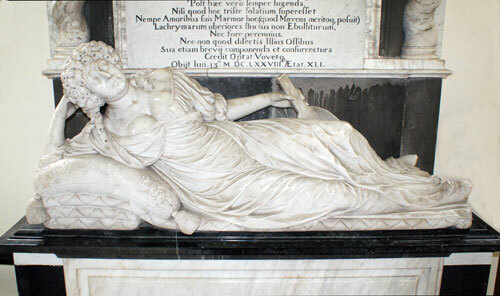 While the Vyner monument has very bold acanthus volutes with winged cherub heads either side of the inscription panel on the base, the effigy has a broadly similar treatment to that of Lady Mary. Also related to these monuments is that in the chapel of St John’s College Oxford to Richard Baylie, 1667. Here the extended left leg follows a broadly similar style to that of Lady Mary although the angle of the raised right knee is much sharper. None of the architectural features appear to equate with one another but it is in the finer details that similarities begin to emerge, especially in the treatment of the edge of the mat on which the effigies lie. These monuments all share a possible common origin – the workshop of Jasper Latham. Latham actually signs or can be directly related to only four monuments but, as a leading sculptor and mason contractor who worked under Wren following the Great Fire of London in 1666, he must have had a very large practice. The records of the Mason’s Company list several of Latham’s apprentices and it is reasonable to assume that many of the monuments attributed to Latham were actually produced by the apprentices and journeymen under Latham’s direction. By stylistic analysis it is reasonable to attribute Lady Wolryche’s monument to Latham’s workshop.